Weber is one of those composers, like Beethoven, whose collected operatic, stage and occasional overtures are sufficiently varied and stimulating to make a satisfying programme on their own. Given also that Weber was a contemporary of Beethoven, dying a year earlier at age thirty-nine, the innovations and influence of his compositions become all the more remarkable, as acknowledged by those who followed, including Berlioz and Wagner, the latter succeeding Weber as the Royal Saxon Court Kapellmeister, and then Mahler, through his work on Weber’s operas Die drei Pintos, Euryanthe and Oberon. Somewhat later, of course, Paul Hindemith wrote his Symphonic Metamorphosis on themes of Weber. Collections of these Weber works are quite common on record, better known examples being those of Herbert von Karajan (DG), Wolfgang Sawallisch (EMI) and Neeme Järvi (Chandos). The selections are not always the same, which may seem good for variety’s sake, but more often than not it means short measure, which is the case here, recorded in the CD era when 80 minutes were available. Adding just the Peter Schmoll overture, say, would have taken this compilation past an hour’s duration. Still, that’s history, and at least Capriccio are releasing it in their budget Encore series. To also be fair, the original mid-1980s Dresden sessions were, it seems, under the now defunct Eterna label when, by arrangement or otherwise, its productions generally appeared ‘west of the wall’ on labels such as Philips, DG and EMI, and in this case, Capriccio. Previous Capriccio releases of this Weber concert have been on LP, CD and SACD, the last suggesting the existence of quadraphonic masters. The current release, though, is a plain vanilla stereo CD. Euryanthe launches proceedings – well, how else do you start a programme of Weber overtures? – and establishes, among other things, the superb playing of the Dresden Staatskapelle, ripe and richly burnished in full, warm and impactful sound. As noted above, the recordings were made when Germany was still divided, and those on the eastern side seemed intent on showing their prowess wherever they could; I’m not sure if musicians respond to the same stuff as athletes do, but these are some pretty muscular performances. 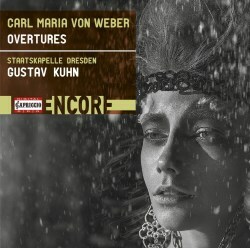 Under Gustav Kuhn, they are expansive without slackness, delightfully pointed and detailed, and if not as stylish as Karajan’s or as highly charged as Sawallisch’s or Järvi’s, are nevertheless wholly rewarding. Shortish gaps between the works sustain the musical pulse and encourage continuous listening. Der Freischütz has a powerful dignity, while Oberon is a splendid mix of uneasy calm, vitality and vigour to match its chimerical nature. In between, the preoccupations of the time with things supernatural and of the East play out tellingly through Abu Hassan, Preziosa and Ruler of the Spirits. And what better ending than Jubel, with its rousing coda of ‘God Save the King’ (actually for Friedrich August I) which, while my republican derrière remained firmly locked to the couch, gave me a thrilling sense of closure. The liner notes are excellent for a budget production, informative and erudite. While I would have preferred Capriccio to reprise the SACD version of this disc, it is still a Weber concert well worth reissuing, played with vitality, dignity and power, in sumptuous sound.